Only 1 manufacturer’s coupon may be redeemed per item; No substitutions are allowed. Product specific Checkout Coupons cannot be used with any other manufacturers’ coupons for the same item. Non-product specific store Checkout Coupons can be used with another manufacturers’ coupon. For example: a customer may use a coupon for “50¢ off any Produce item” and a manufacturers’ coupon on the same item. Q:What is your double coupon policy? 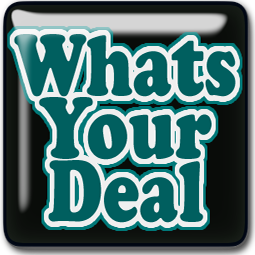 A:In order for a coupon to be doubled, the Customer must use their Stop & Shop Card. We double the savings marked on manufacturers’ cents-off coupons up to 99¢. Any coupon $1 and over will be redeemed at face value of the item purchased. In cases where the double coupon total exceeds the value of the item, the offer is limited to the retail price. Lottery tickets, cigarettes, tax and items prohibited by law are excluded. A: No. 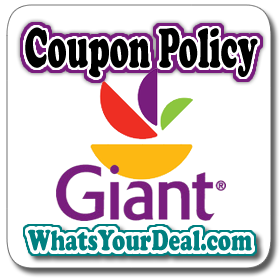 Giant Food of Landover MD does not accept competitor’s coupons. A: Yes. We do accept Internet coupons unless we are notified of fraudulent activity involving specific Internet coupons. A: Giant Food of Landover MD does not accept coupons of any type for the purchase of gift cards.